You go on a hike to reach a destination, you go on a nature walk to explore the terrain, but have you ever ventured into the forest just to bathe in its presence? Okay, before you backpedal your way out of this article, I promise this isn’t a total “woo woo” post. There are actually some rock-solid, science-backed and stellar benefits to what began as a simple Japanese tradition in the early 80s. Shinrin-yoku, the Japanese practice of “taking in the forest atmosphere” or “forest bathing”, has gained considerable exposure over the past several years, and medical professionals, wellness coaches and retreat centers around the world are beginning to encourage the practice for the host of benefits it offers. The Japanese Ministry of Agriculture, Forestry and Fisheries coined the phrase Shinrin-yoku, and it specifically refers to the process of intentionally pausing to soak up the sights, smells and sounds of nature to promote psychological and physiological wellness. Incredibly, in both Japan and Korea, forest therapies are so lauded that they’ve even been integrated into the standard medical system and, in certain instances, covered by insurance. Well. Kind of. Those excursions are beneficial (for you and Fido), but you can take your wellness experience to the next level through the purposeful practice of soaking in your surroundings. 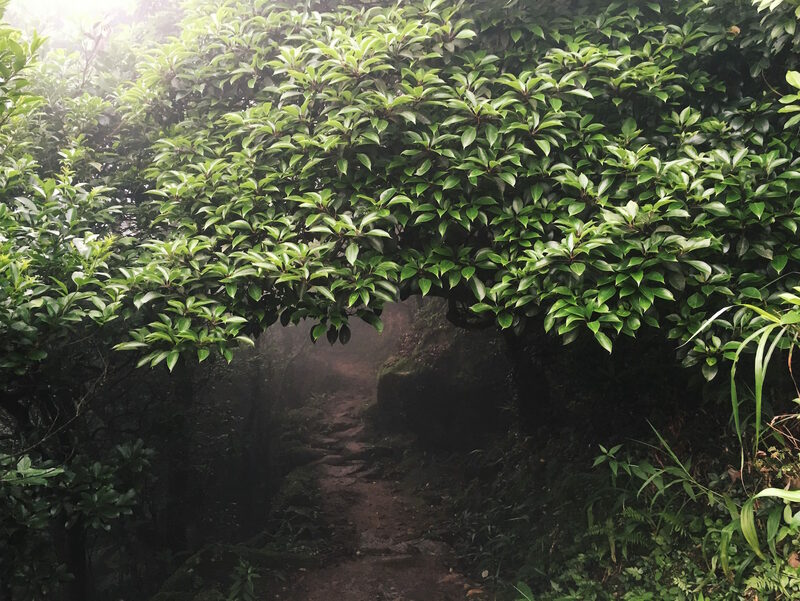 Those that practice Shinrin-yoku explain that it differs from hiking (or similar) because it centers on the therapeutic aspects of your environment, and yourself in your environment. So, what does science say? Scientists suggest that one of the most promising aspects of forest bathing involves the inhalation of volatile substances, called phytoncides (wood essential oils), that trees and plants emit such as a-pinene and limonene; in a more poetic sense, phytoncides are the “aroma of the forest”, or that telltale and familiar scent that you experience when you’re surrounded by lush plant-life. Interestingly, the purpose of phytoncides is to protect plants and trees from insects and other threats. So, just as phytoncides have the ability to serve protective functions in trees and plants, scientists believe the benefits extend to human immunity as well. Natural Killer cells (or NK cells) are a type of lymphocyte (a white blood cell) and a component of innate immune system. They play a significant role in our body’s ability to recognize, isolate and “kill” both tumor and virally infected cells. And, NK cells are noted to be in short supply and quality in those with diseases on the immune spectrum, such as cancer. While breathing in phytoncides may not be solely responsible for the favourable increases in these important players in your immune system (lowered stress, improved cognition, etc., contribute to immune health as well), there’s a lot to be said for trading in city smells and breathing in forest aromas instead. Stress is not our friend. We already know this. We hear this all the time. Unless we’re being chased by a lion, or need the adrenaline surge required to lift a car off the pavement with super-human strength, then we need to get our stress in check. Forest bathing exerts a cascade of positive effects on stress levels. A large Japanese study from 2010 showed favorable impacts on blood pressure, heart rate, concentrations of salivary cortisol (all players in the physiological stress picture) and levels of urinary adrenaline when compared to those who walked through cities. And other studies conducted around the world showed similar physiological and psychological (perceived changes in mental states) results from being in green spaces, versus urban settings. A study assigned sixty participants to a 50-minute walk in either a natural or urban setting in California. Compared to the urban walk, the nature walk resulted in affective benefits (decreased anxiety, rumination, and negative affect, and preservation of positive affect) as well as cognitive benefits (increased working memory performance). Research in the United States has also investigated the effects of outdoor green spaces on symptoms of attention-deficit/ hyperactivity disorder (ADHD) in children. Symptoms were reduced in children who spent time in green spaces, compared to children who spent similar time in urban settings. But beyond symptom improvements in children, most interestingly, more frequent time in green spaces could even have implications on the need or dosing for typical medications. Forest bathing also has the potential to lower blood sugar. A Japanese study followed 29 males and 58 females all diagnosed with non-insulin-depedant diabetes for six years. During this time, participants walked in a forest for 3 or 6 kilometers (1.9 or 3.7 miles), depending on their physical ability, on a mere nine different occasions. At the end of the study, several different markers relating to sugar metabolism had improved: blood glucose, insulin resistance, and hemoglobin A1c. Because the frequency of the walks was minimal, but blood sugar levels had significantly decreased, researchers were able to extrapolate that exercise wasn’t the only reason for the improvements; that other factors unique to forest bathing positively influenced the results. This is where intentionally “soaking in”, pausing and reveling in beautiful surroundings carries added benefits over just a hike or taking your dog (remember Fido?) on a walk. Astronauts returning from space often recount transformative, life-altering and almost spiritual experiences after viewing the vastness of space, earth from space, and the weightlessness they experience in anti-gravity settings. You might be wondering how forest bathing relates to space travel, but it all comes down to the “awe effect” and how cultivating this emotion on a regular basis can positively impact your health. Researchers have explored the relationship between discrete positive emotions and inflammation markers, finding that the sense of awe was the the strongest predictor (over joy and other positive emotions) of lower levels of pro-inflammatory cytokines. So, all together, the sights, sounds and smells that you’ll experience while forest bathing, the green-scapes and dense beauty that have the potential to provoke deep awe-inspiring experiences, all have great potential to improve your health: body, mind, and spirit.